Take Ten - CLAYTON PELHAM, JR.
Clayton Pelham, Jr. and Anne Bowles in 1st Stage's Hero's Welcome. 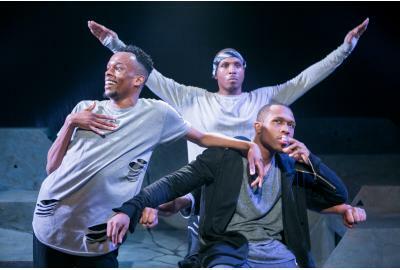 Justin Weaks, Clayton Pelham Jr. and Chris Lane in Theater Alliance's Words Become Flesh for which Pelham received a 2017 Helen Hayes Award nomination as Outstanding Supporting Actor and was recipient, with the cast, of the award for Outstanding Ensemble in a Play. 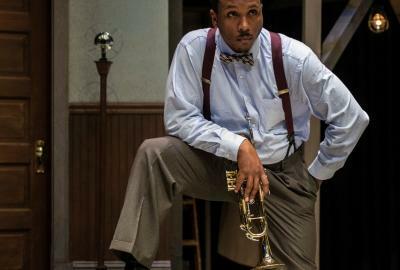 Clayton Pelham, Jr. in 1st Stage's Ma Rainey's Black Bottom for which he received a 2018 Helen Hayes Award nomination. From church-basement dinner-theater to an Athol Fugard drama that helped drive home how personal and passionate storytelling could be, actor CLAYTON PELHAM, JR. had a theatrical education that encompassed all kinds of narratives. 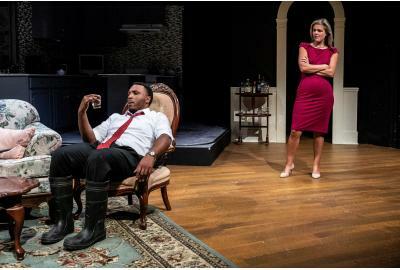 He takes time out from the run of 1st Stage’s Hero’s Welcome (which continues through Oct. 7) to talk about losing himself in a Neil LaBute script — while standing in a bookstore! — and getting lost between Marc Bamuthi Joseph’s lines during the Theater Alliance’s production of Word Becomes Flesh. It’s all part of this week’s Take Ten from theatreWashington. I can't really remember the first play I ever saw outside of the local Christian-Gospel themed, anti-abortion theater production my high school took us to see my freshmen year. That was pretty terrifying. However, the first professional show I remember having any significant impact on me was My Children! My Africa! at Studio Theatre, summer of '08. Man o' man! That production was filled with so much raw passion! I was so engulfed in the world of this play and entranced by the work of the artists on stage. It was the first time I was moved to tears by any production. After seeing that show, I remember feeling like I wanted to bring that same passion to my work as a storyteller. My first involvement in a play started with my church when I was about 7 or 8 years old. Every year, we'd put on a Christmas show at another church not to far from our own in Forestville, MD because that church actually had a proscenium stage with curtains, dressing room and everything. And every year our church would serve food to the audience. My first introduction to dinner theater and I didn't even know it. I think I played one of the Wise Men or something like that. It was pretty cool. My favorite play would have to be Neil LaBute's The Shape of Things. I remember living in Atlanta and going to Borders Bookstore, and I heard about the play before but didn't know too much about it, so I started reading it. When I tell you I couldn't put it down - it was the first script I read all the way through in one sitting. Evelyn was - something - in that play! But deeper than that, the play asks questions about who our society views as beautiful, handsome, attractive or unattractive, and why. Do we truly love the things/people we love because they genuinely bring us joy or are we just attracted to the shape of things? The worst day job would have to be working as a waiter/bartender for the last four years. The money can be great sometimes, addictive even. Guess that's why I stayed there so long. But dealing with petty micro-managing supervisors who don't truly value you outside of what you can do to help them reach the daily sales goal and dealing with whining guests. I learned a lot from being there, but most important I learned that that wasn't how I wanted to be of service to the world. My most embarrassing moment was doing a performance of Words Become Flesh and I went up on a line. Thankfully, the show is all spoken word, so I just kept saying the previous line in a poetic loop until one of my other brothers on stage threw me a word and saved me. I don't think the audience picked up on it, but I was drowning in a whirlwind of poetry and couldn't find a word. 6) What are you enjoying most about working on Hero’s Welcome at 1st Stage? Well, first of all, 1st Stage treats you like family. I love working in such a welcoming environment. Alex knew exactly what he wanted as a director, a clear vision. Which made the process of learning a different dialect and everything else we were juggling a lot smoother because we could trust that Alex was going to guide us in the right direction. And besides that, my cast is sooo DOPE! Love you guys! My dream date would have to be with my father. He passed away when I was about 15 and there's so much I wish I could've learned from and about him that I never had the opportunity to learn. I would listen to all his stories, he had a bunch of them. My dream role would be Cory in Fences. Pretty much any role in the August Wilson canon. I would see Fences on Broadway with James Earl Jones. Enjoy life so you can bring it to your art. 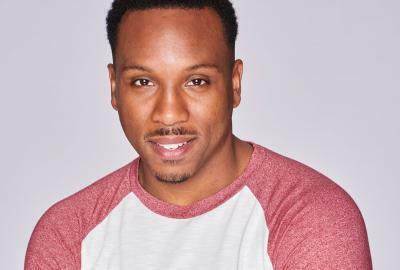 CLAYTON PELHAM, JR. is back at 1st Stage in Hero's Welcome after previously appearing in Ma Rainey Black Bottom (Helen Hayes Nomination, Outstanding Lead Actor in a Play). Other credits include –The Great Society (Arena Stage); Word Becomes Flesh (Theater Alliance); Charm (Mosaic Theater Company); The Orbit of Mercury (Spooky Action); Be Awesome: A Theatrical Mixtape of the 90s (Flying V); Season of Light (Discovery Theater); The Miser (Faction of Fools); Solomon and Marion (Anacostia Playhouse); A Raisin in the Sun (Compass Rose Theater). Upcoming: Native Son (Mosaic Theater). Clayton’s television credits include: Orange Juice in Bishop’s Garden (20/20 Productions); Criminals at Work (Black Entertainment Television), Southern Fried Homicide (Investigation Discovery). Film: Money Matters (Streamline Film Works).